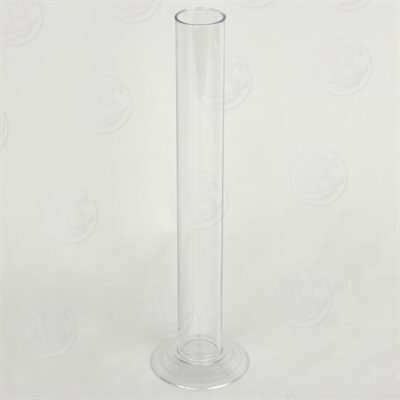 12" Clear Acrylic Hydrometer Jar, One Piece - F.H. Steinbart Co. This ONE piece molded hydrometer jar is made with alcohol resistant plastic. 12". It can be used for everything, wine, beer, and liquids with high levels of alcohol. Stable base and wide cylinder for accurate measurements. – This Testing Jar could replace glass hydrometer jars. – Wide base, make it more stable. – Hydrometer won't stick to the walls because the tube is wider allowing more accurate readings. – Easy to clean with a beer brush. – Since there is no glue (it is a ONE piece testing jar), there will be no leaks at all. – Maximum Temperature: 75 °C (167 °F). ABT 11" S⁄S False Bottom, Fits 15 gallon Keg Blichmann Burner Leg Extensions - 24"